Wow, it’s warm for the season, at least for one more day. We’ll be pushing ninety today as the warm breeze out of the south continues to blow. Changes are already underway west of the Ozarks as a cold front makes its way closer to us tonight. Showers and storms are a safe bet in the area by this evening. A few storms have the ability to become severe northwest of Springfield as they first fire this evening. These storms have a quarter-size hail potential along with some gusty winds. 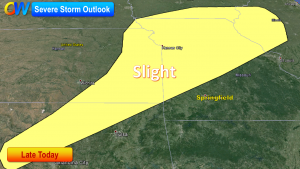 Overall, the threat of widespread severe weather is low. The cold front will send our weekend temperatures down. We’ll enjoy high temperatures back in the seventies on Saturday and Sunday. The pattern of weather next week as calm with near normal temperatures.